Many people are choosing to study online, it is easier for them because they have a full time career, it is less time consuming for them or they just enjoy the challenge and opportunity to learn something new for themselves. The world is getting smaller and bigger with the internet, and information and education is reaching out to new people that did not have this kind of accessibility before. 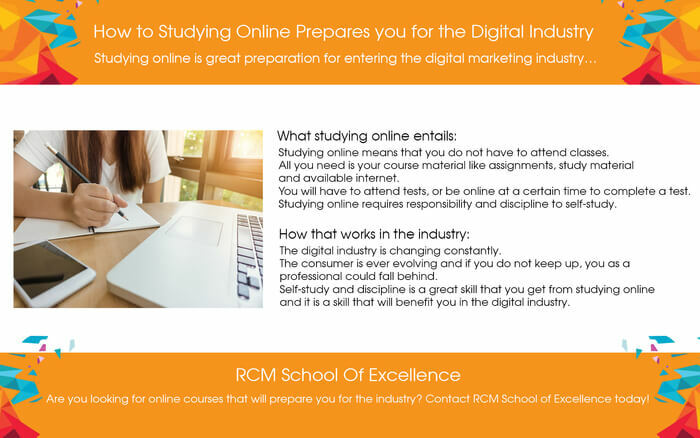 But what some people might not realise that studying a digital topic online is great preparation for entering the digital marketing industry. The ability and discipline to self-study is a great skill to have. Studying online means that one does not have to attend any classes, and all they do need is an internet connection to be able to receive their course materials such as assignments, study material, and they need the internet to be able to do research and of course, submit all their work. It means that each person will have to take it upon themselves to find the time and space to go through all their course materials, study and complete assignments before their deadlines. They will of course have to attend tests, or be online at a certain time to complete a test or exam if they do not have to be physically present in a venue. It requires that each learner takes the responsibility of themselves to get their work done when it needs to be done. In a fast pacing, digital industry things are constantly changing. If you do not keep up with the news and new trends within the industry, you as a professional could fall behind and so could your company. The consumer is ever evolving and changing, and the world of branding and advertising needs to keep up with them in order to reach them. Self-study and self-discipline is a great skill to have as it shows that you are prepared to take your own intuitive and that you don’t need to be spoon fed any instructions. The digital industry is a very competitive one and every brand and agency is looking to be a leader in thought and innovation, and they are always looking for the next and best talent. Studying online is a great way to help you grow and learn, especially if you are already in the industry or looking to change careers. Visit RCM School of Excellence today to enrol in the online course that will help you build a great future.